Native to Africa, the Addax Antelope is white with a grey-masked face. The horns cork-screw upward making two or more twists on both mature males & females. They are native to dry deserts. Their feet are adapt to run on sand. A member of the Oryx family, a large male can weigh up to 275 pounds while a female can weigh up to 200 pounds. Both male and female make for very good trophy mounts. 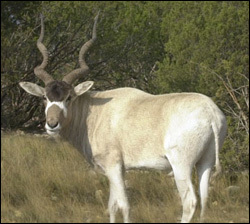 The Addax is available to hunt year-round.